The Klip Editor is where you create and edit Klips. You can also create data sources in the Klip Editor. Every Klip is made up of attributes called components that control virtually every part of your Klip, from its title to its visualization style. The Klip Editor lets you work with your Klip components to customize your Klip's data, properties, and appearance. The Component tree displays your chosen components and their sub-components. Use the Component tree to choose which component or sub-component you want to work on in the workspace panels below. Every Klip is made up of components - all components are shown in the tree. View the hierarchy of the Klip to understand what part of the Klip is being edited. Use the component tree to select the components to edit in the workspace panels below. Once you have chosen the component or sub-component you would like to work on in the Component tree, use the Workspace Panels to make changes. 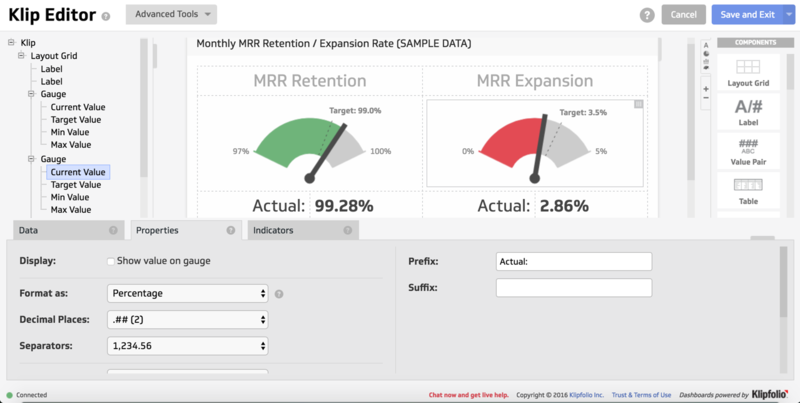 Assign data to components and create formulas with the Data panel. Edit a variety of attributes (titles, value formats, appearance) with the Properties panel. Apply threshold indicators (colour changes, display icons) with the Indicators panel. The middle area of the Klip Editor is the Klip Preview area. 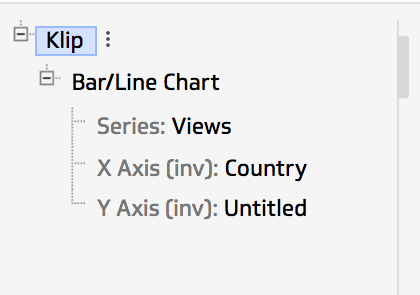 This is where you can see your Klip and the edits you are making to its component or sub-component. 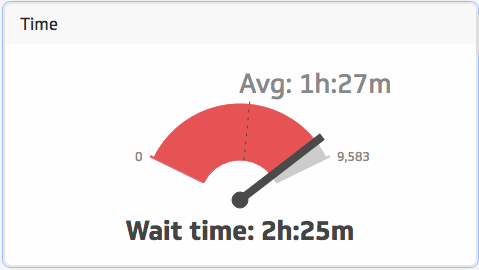 Preview of how Klip will appear on dashboard. The Components Palette contains a list of all the components you can add to a Klip. Use the Components Palette to drag your chosen components onto a Blank Klip, or add components to any existing Klip. With the Components palette, you can create a Klip with multiple components. Drag and drop components from the Components Palette into the Klip Preview. Use the Layout Grid and the Separator to arrange your components. 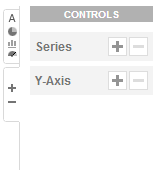 You can find the Controls Palette in the same sidebar as the Components Palette. The Controls Palette is a simple menu that contains controls for the specific component that you are editing. Add or remove data series, columns, rows, mini-charts, or ranges depending on which component is selected.